Clarion Books (Houghton Mifflin Harcourt), 2016. 32 pages. Oh, such a sweet and cozy bedtime tale! (except for one I fed to Jasper), Mom takes my plate. “It’s been a good day,” she says. “It is a good day,” I tell her. Because the day’s not finished yet. And it is not time for sleeping. We get little scenes as the evening continues on, but after each scene, it is still not time for sleeping. Telling what happens accumulates, and the words have a gentle rhythm. I like the way the boy yawns and stretches even as he affirms that it’s not time for sleeping. Each scene is cozy with getting-ready-for-bed things. I’m tucked tight in my bed and the story is done, Mom turns off the lights. All I can see is the glow from the hall. There is one more thing the boy needs, something Mom and Dad will never forget – a tight bedtime hug. I whisper back. “Good night.” And I close my eyes. Because now . . .
Now it is time . . . This book makes me sleepy just talking about it! The danger is that your child will realize it’s sleepy-making and will not want to read it at bedtime. But I’m hoping that the title, which says it is NOT time for sleeping, will help. But this follows the rule of the best bedtime books: A child is sleeping at the end. Source: This review is based on a book from Fairfax County Public Library. 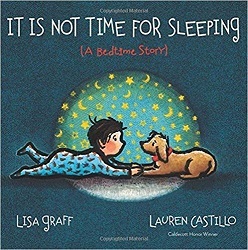 This entry was posted on Wednesday, December 26th, 2018 at 11:47 pm and is filed under Bedtime stories, Contemporary, Picture Book Review, Starred Review. You can follow any responses to this entry through the RSS 2.0 feed. You can leave a response, or trackback from your own site.